Thai cuisine, delicious and complex, is a delicate balance of sweet, spicy, sour and salty flavors. On this culinary tour of Thailand, learn how to use exotic ingredients such as keffir lime, lemongrass, coconut milk, and gangal ginger to prepare delicious traditional, regional, Thai meals and learn presentation techniques. Your private guide will lead you through the main cultural attractions in Bangkok, including colorful floating markets, the Grand Palace and the most impressive temples in the city. Next, visit Chiang Rai and Chiang Mai, experiencing the Lanna culture and authentic cuisine in noted local restaurants. 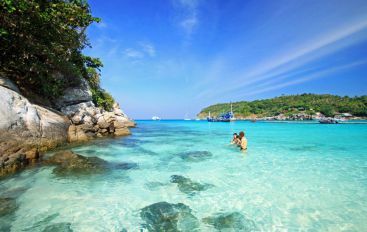 Fly south to Phuket and feel the warm sand of this world famous beach. Welcome to Bangkok – the city of Smiles. Your Travel Thailand tour guide and driver will pick you up and then transfer you to your hotel to check in. In the evening, enjoy a special welcome dinner on The Chaophraya River. This morning you will take part in a joining-in Thai cooking class. This is the opportunity to learn how to cook real Thai food in a traditional “home-style” Thai setting. Afterwards taste your dishes for lunch to complete this unique and truly Thai experience. Afternoon, discover some highlights of Bangkok including the Grand Palace which is the official of the King of Siam since 1782, made up of numerous buildings, halls, and pavilions set around open lawns, gardens and courtyards. It is located on the bank of The Chao Phraya River. Inside the Grand Palace complex is Wat Phra Kaeo or Temple of the Emerald Buddha – the most beautiful and sacred Buddhist temple in Thailand.Then, visit Wat Arun which is known as Temple of Dawn – one of the most well-known sites in Bangkok. It is best seen from the opposite side of the river. After breakfast, your Travel Thailand Guide shall pick you up at your hotel then drive to Damnoen Saduak Floating Market – the most colorful of Thailand floating markets – 104 km southwest of Bangkok. You can see boats of various shapes and sizes which carry goods for trading such as tropical fruits, vegetables, flowers and food on wooden boats with smile of vendors. Experience a thrilling long-tail boat ride out of the floating market and journey along the winding canals to see remote villages, gardens and plantations. Then transfer back to Bangkok for your flight to Chiang Rai. Welcome to Chiang Rai – an ancient place which has Lanna culture, custom and local food. You will relax, be happy and also impressed with nature at Chiang Rai. Today you have a full day to explore Lanna culture. Begin to visit Phra Tamnak Doi Tung – a beautiful royal residence and garden with scenic view at the top of the mountain. This is one of her majesty the queen mother royal successful projects, Phra That Doi Tung, the temple's most important structures are its twin chedis or stupas which were built in Lanna style by the king of Chiang Sean in pre-Thai days. The stupas were erected to enshrine relics of the Lord Buddha's collarbone in 911. When the construction of the stupas was complete, King Achutaraj of Ngon Yang ordered a 2-Kilometer-long giant flag or Tung in Thai to be flown from the peak, which gave the mountain its name. Visit a jade cutting factory and local market before returning to the hotel. Another try with cooking class in Chiang Mai to see how it is different with that in Bangkok. Our tour guide will pick you up at hotel and go to the local market with chef. Learn more about ingredients, learn to cook the first three courses you choose and have lunch with what you have prepared. Another try with cooking class in Chiang Mai to see how it is different with that in Bangkok. Our tour guide will pick you up at hotel and go to the local market with chef. Learn more about ingredients, learn to cook the first three courses you choose and have lunch with what you have prepared. Continue the day with a drive to Phrathat Doi Suthep Temple – located 1,050 meters above sea level. It is the most sacred temple in Northern Thailand. Here you can see the marvelous golden pagoda, which is containing the holy relics of Lord Buddha. From the summit of Suthep Mountain, you can see the panoramic view of Chiang Mai city and Ping valley. Morning is free at your leisure until transfer to Chiang Mai airport to take flight to Phuket. On arrival, driver will pick you up & transfer to the hotel for check in. This morning, your tour guide will take you to the cooking class. Start a morning market trip to explore and see hundreds of exotic ingredients, tasting delicious seasonal fruits and making traditional style homemade curry paste. You will prepare, cook and eat what you have cooked. You will receive full color foolproof recipe cards to take home – a unique experience in Phuket. In the afternoon, free at leisure on the beach. Today is free at your leisure for last minute shopping or sight-seeing before driving to the airport to catch flight back to Bangkok for your departure flight home. Great tour, highly recommended if you're hoping to see a little more of Thailand outside of Chiang Mai. The white temple is beautiful! Make sure you soak it all in because you can only go through it once and it ends in the exit. I wished I had taken more pictures because I didn't realize i could go back through. This is a long tour so expect to be out all day, but it is totally worth it! 1. The tempel tour : i was very impressed by the tempels i saw! The sang kaew photiyan and the wat hue pla kung was for me the most amazing and impressive. The wat rong khun, wat rong sauten and the black house museum were also very beautiful. 2. The lunch : an very good extensive buffet with a nice view on the river. 3. The driver : very kind and professional driver, stopped when you wanted and very safe. 4. The service : very professional, i was forgotten my tripod in the car and the day after they bring it back to the hotel. 5. Conclusion : professional company with honest people that give me fantastic days!! !